How a good prototyping tool with an excellent set of pre-made UI libraries will let you build interactive UI wireframes and jumpstart your creative process. So there you are, in front of your computer/blank paper/napkin (??) Whatever you use to start mocking up a project. You have lots of instructions from your client, millions of ideas in your head, a timeline, a dateline, a budget and, in front of you, an empty canvas. Combining all the above factors is not easy, where should you start? Well… are you a hands-on kind of designer? Then start creating with a prototyping tool, like Justinmind. Have a blank canvas no more! The cool thing about a prototyping tool is that you can start filling up the empty screen right away. Let´s say you are developing a web app. Go to the Widgets tab and start putting together a UI wireframe: you just have to drag and drop the ready-made UI elements for web, such as form fields, menus, input fields, buttons, etc. 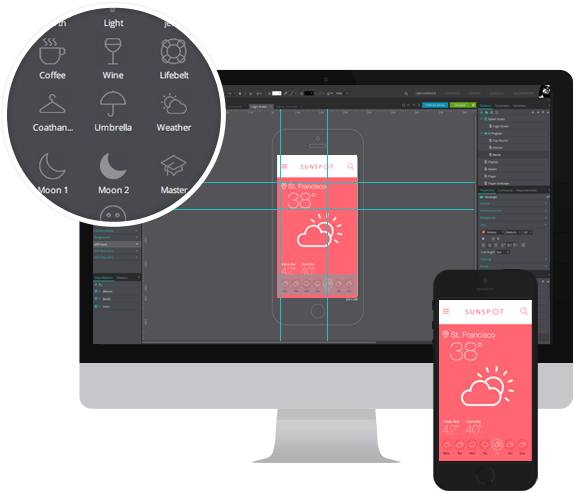 Justinmind also offers pre-built UI kits specifically designed for iOS, Android and other mobile devices. These include a handy collection of native iOS and Android buttons, menus, tabs, and title bars that will fit perfectly into any of your mobile wireframes. Without any technical expertise, you can easily add hotspots to get clickable regions, and link interactions. Then you can raise the bar, applying advanced web and mobile interactions, gestures and transitions, animations and effects, which will allow you to define any solution you have in mind. And finally, see your ideas in action by simulating all that you’ve built so far with a simple click. You will be able to reproduce any user trigger, action, conditional behavior, data-driven functions, to the last detail, as if it were the real app. But with no code involved whatsoever. Now stop, take a deep breath, and get a feeling of the flow, function and interaction of your creation. You find some bugs? No biggie. With Justinmind Prototyping Tool you can correct and adjust anything in a matter of seconds. In fact, even though it looks so real, there is no coding involved, and iterations are made in a snap. What to do with the final creation? You can export your design as HTML and anyone will be able to see it in any browser. You can also upload it on Justinmind online account and share it with your team. And you can generate a specification document with images, notes and comments, to hand to the developers. Now you have it, your prototype, on time, on budget, ready for your clients review. What happens next? That’s another story, and we told it here.